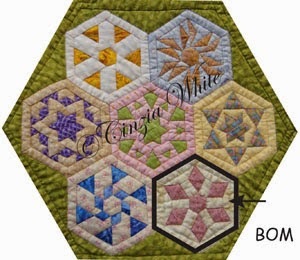 The free BOM for this month is a hand pieced gem. It was one of my early ones of moving into combining circles with different outers. 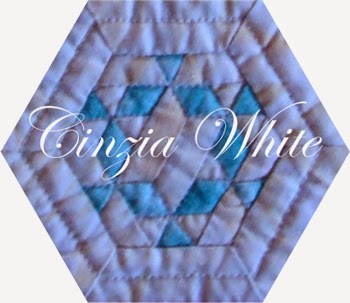 Although I pieced the whole of this block I know that many others are choosing to appliqué the circle over the top of the otherwise completed block. We all have our own preferred methods. 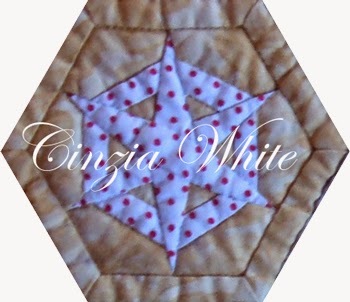 Well another free motion quilting exercise finished and very cute too ! 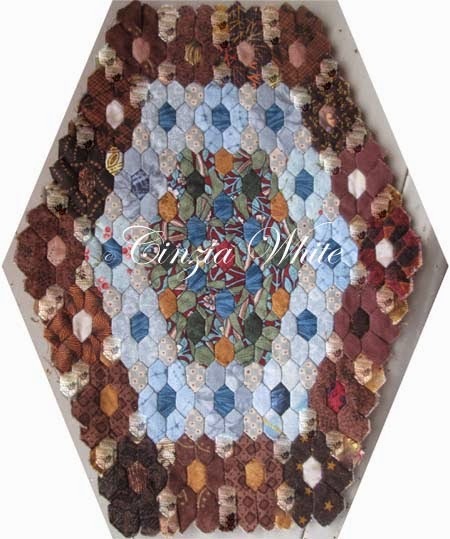 This was another block that appeared in Quiltmaker's 100 Blocks, volume 9 I think. It was called I Should Have Flown South by it always reminds me of that line we have heard so many times when starting out on a trip with our children Are We There Yet? I enlarged it by 140% and so rather than a 12in block it is now 18in ..well there abouts. 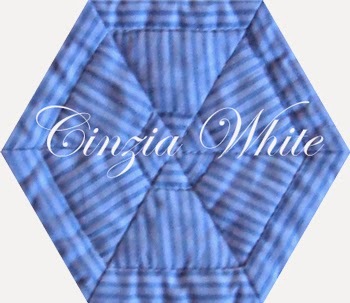 Perfect for a pram quilt I think. 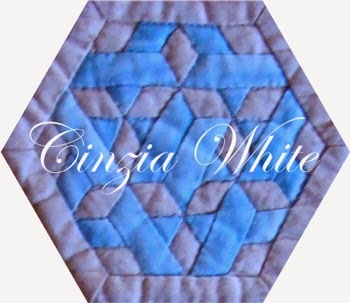 Well it is time for me to bite the bullet and start to work on my free motion quilting. 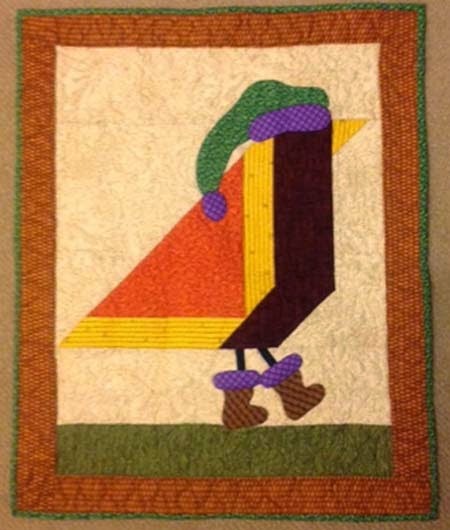 A few weeks ago I did a class in needle turn machine appliqué. The class was to be a vase of flowers, which as beautiful as they were, was something that I knew I would never finish so I decided to make Gertie instead. 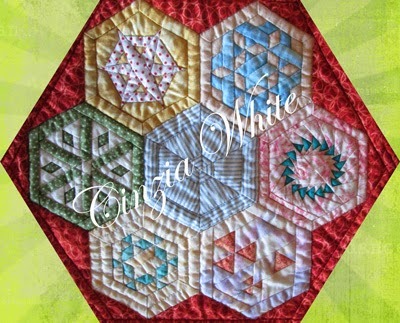 OK so I'm still playing with hexagons, even though it is about time I put my mind back onto the wedding quilt. But you have to admit it is cute isn't it? 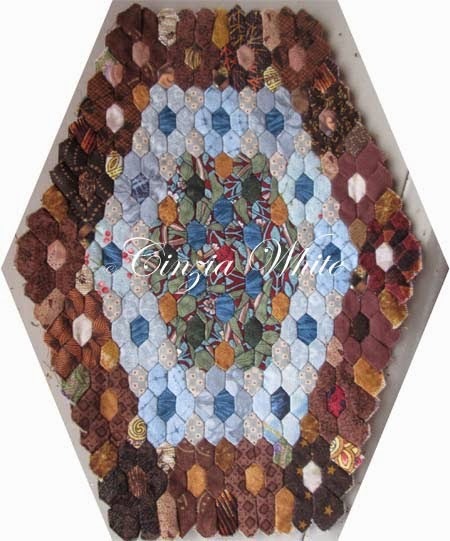 The hexagons for this are actually elongated hexagons and each side is only 1/4in. An elongated hexagon has two angles that are 90 degrees and the other angles are by my calculations 135 degrees. I suppose I should have put a coin or something else beside it for reference ... next time I promise but if you can take my word for it this section is a bit under 6in high and 4 1/2in wide. Next instalment next weekend. 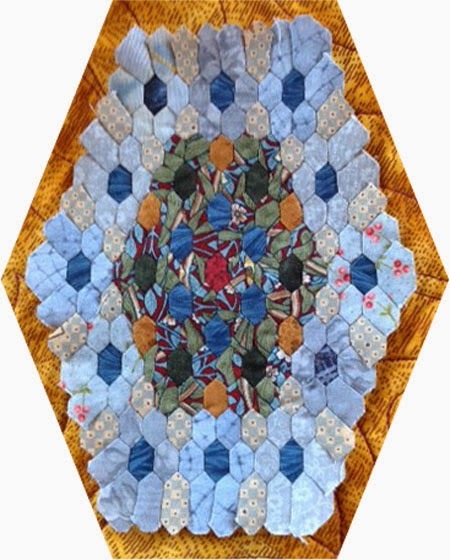 I saw this quilt in a museum. The original had been used to cover a tractor until it was rescued and repaired. Looks good so far. 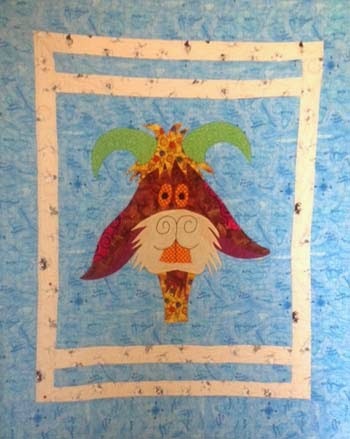 Oh the original was a lot bigger but again I want a take anywhere project and even when this whole quilt is finished I doubt it will be much bigger than an A3 sheet of paper. 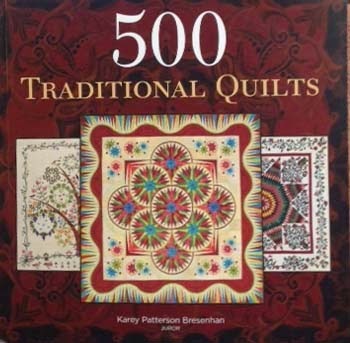 Well I know you haven't seen it yet but Lark publications is about to release the latest book in their 500 series and you guessed it, it's all about traditional quilts. 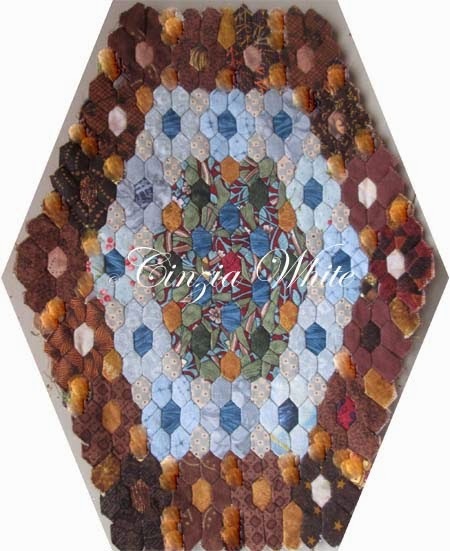 Don't we all just love traditional quilts. 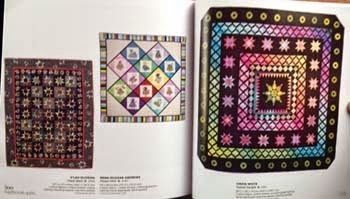 This book is an absolute feast for quilt lovers with beautiful photos of 500 quilts. 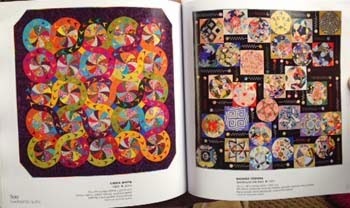 I couldn't believe it .. mind you the one downside is that there are so many other wonderful quilts that I just would love to make. Would be wonderful to see them in real life wouldn't it. The Future Awaits doesn't the design remind you of those science fiction movies where people go into a trim travel machine and then they spin off to somewhere else .. or perhaps it reminds you of the spotless nurses uniforms? Ribbons of Peace what a peaceful coloured block. If only the world could be so peaceful and enjoy the ribbons of children playing in the parks and laughing. Nuclear Free amazing how so many of this month's blocks have a theme of fear of the future. Isobel was the first person I designed and wrote a pattern for. 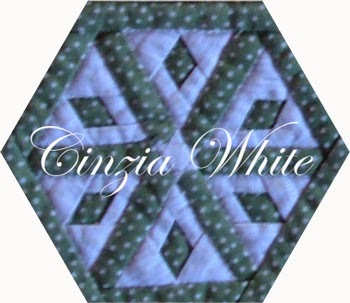 She had liked one of my other patterns and wanted to modify it. When I suggested this one she jumped at it. 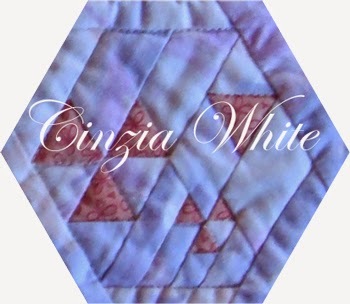 I should find a photo of her quilt and upload it. Rhonda is a dear friend. Full of life and laughter she was always the life of the party and of course she loved spots. 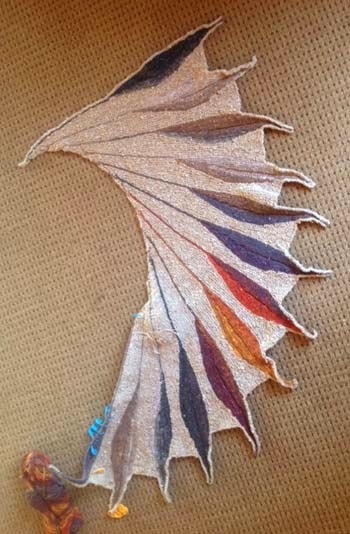 This fabric came from her stash. 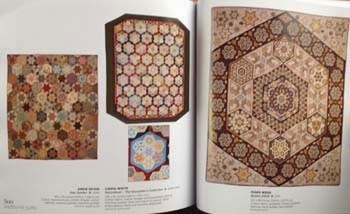 Working Together was the melding of two designs. 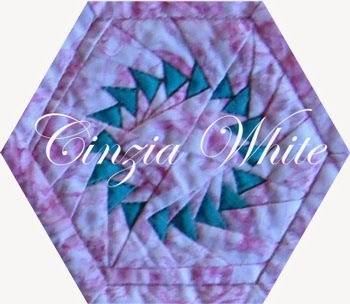 I think it may have looked more dramatic if I had used two colours for the design but didn't want that in this quilt.